The newest crack in my Mayo heart is still raw since our latest fall reaching for the Sam Maguire. With that fateful Sunday still fresh in mind, I haven’t been much able to read or talk about the game. But the craic and the crowd were mighty at The Blackthorn for the All-Ireland Final. “I didn’t know there were so many bog men in New Jersey,” said my Dubliner friend Paul Anderson looking at all the green and red shirts crowding the room. I had invited the Jackeen in from Pennsylvania to watch the match. He rightfully enjoyed his day, sipping his victorious blood-red wine while sporting his Dublin Fire Brigade t-shirt. Before the last whistle blew the gathering there was the grandest of Irish parties, better than a St. Patrick’s Day bash. I was one of a few with an American accent. Now with the Sam in the hands of the Dubs and the leaves beginning to turn a brighter shade, thoughts are already turning to the next high holy day of Ireland’s patron saint. It will be here before we know it. Committee meetings and fundraisers for next year’s parades are already underway. Many local public houses recently marked the non-occasion of halfway to St. Patrick’s Day. The Irish Busin/ess Association (IBA) held its monthly meeting on that date at The Blackthorn in Kenilworth. There was a bit of music and a step dancer out on the deck in the pleasant late summer evening air. But it was their guest speaker that drew me to the event. Like a sports fanatic who would happily give a right arm to meet his favorite star player, I deeply treasure meeting artists that entertain and move me. In my case, it is mainly photographers and writers. Thankfully, most I admire are still alive. He recounts loving, painful and funny as hell tales of growing up American with Irish immigrant parents in New Jersey. If you are Irish American, you can relate. Besides the brilliant and entertaining hour of speaking with Mike about writing and the like over a pint, there was an amazing bonus to the night. I got to meet his inspiration: his lovely parents who made him what he is, God love them. During our chat we discovered a mutual friend, Irish Voice columnist Cormac MacConnell. We both had the pleasure of Cormac’s wit and company in his local, The Honk, just beside Shannon airport. 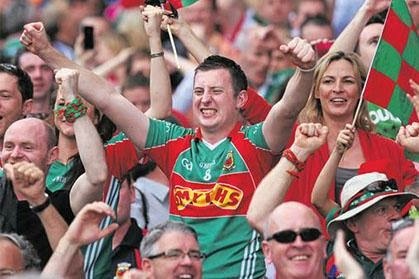 Cormac just wrote a pre-final prophet piece about Mayo losing to Dublin in the big game. Sadly, his prediction was correct. It was the only article about the game that made me smile. Cormac has that gift about him. “As I said to my fellow Mayo men last Sunday, "Lads, what's another year at this point?" Cormac, who once analyzed me over a pint and dismissed my Derry and Cork roots to declare me a thoughtful Mayo man, sent a simple reply.